The first thing I do is to add some thicker paint to the main area of the cherry. This helps to reinforce the colour and is the time you can start to use thicker paint on top of the thinner under painting we’ve already established. I then glaze over parts of the cherry with the alizarin crimson & burnt umber mix. As both of these paints have a transparent nature – they are perfect for adjusting hues using thin layers of acrylics. 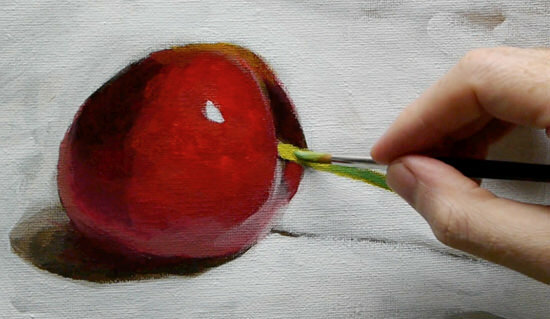 I then add a bit more warmth to the cherry by adding a touch of the pure cadmium red light. It is still quite a thin layer though. I then tweak the drawing. With the finer sable brush (you don’t have to use a sable any small round would be fine) I can then lighten the purple as we get closer to the light source. I then introduce some cadmium red medium and mix this with the burnt umber to add a warmer top edge to the cherry. This is the final stage of the painting. I now add some pure titanium white for the highlight, just one quick mark. Be careful not to try and get too fussy with your highlights when you are first beginning painting, one quick mark will look more effective. So I now establish a general colour for the stalk using pure Cadmium yellow light. Then I can work darker mixes of green on top, using the Green gold. As it is a translucent paint the yellow of the stalk can still glow through. I can then use a muted green mixed with Burnt umber and yellow to add a depth to the tip of the stalk. 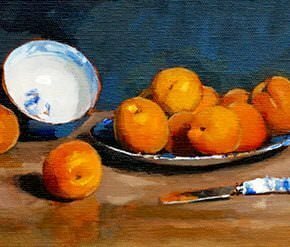 I then mix an orange with the Cadmium red light and cadmium yellow light and add a subtle glaze to the top of the cherry. To add more detail to the stalk, I mix a darker green using Phthalo blue (red shade) and the yellow. I then mix a thin glaze using the same green to add a green hue to the shadow of the cherry, by doing this it acts as it’s complementary colour to make the red of the cherry, look redder. So finally, I look over the whole picture and check the drawing and make any adjustments. 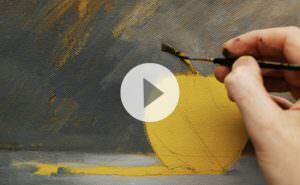 These videos below shows the third and final videos in the acrylic still life painting. Make sure to subscribe to my YouTube Art school Channel to keep updated on future videos, you don’t need an account and you’ll get weekly email updates when a new video is posted. Excellent website – definately the best I’ve come across on painting. Thanks for all the free tips! I’ve stumbled upon this at the right time. I’ve been painting on and off for about 15 yrs, did some classes but am mostly self-taught. Lately I’ve stopped being too much of a perfectionist and my paintings (and completion rate!) is getting better. I’m going to give the cherry painting a go as an exercise for starters. Thanks very much, glad to hear you’re practicing the 80/20 rule! Finished the cherry. Very happy with it – it looks painterly and juicy! I followed your techniques – thought about the colour I was trying to reproduce. What hue, whether warm or cold, toning down etc. This served me well and got me out of mistakes when they happened. Previously I tended to mix colours semi-intuitively which was ok except when I occasionally got stuck and bogged down trying to figure out how to correct my work. Filberts are great! Never used them much before partially because art books tend to emphasise how they are good for “long tapering strokes” (thought you could do that with rounds, flats and brights anyway?!!). Books don’t stress their excellent ability for blending. Your info on greens is useful. I often used phtalo blue and lemon yellow, but this produces almost fluorescent green that usually needs a lot of toning down. The cad yellow and the umbers produce interesting greens. I watched how you used the small sable and how it held the paint so I ditched a synthetic and dug out an old No.6 watercolour brush (Winsor & Newton “Septre Gold” synthetic sable mix). Far better control and loading of paint. 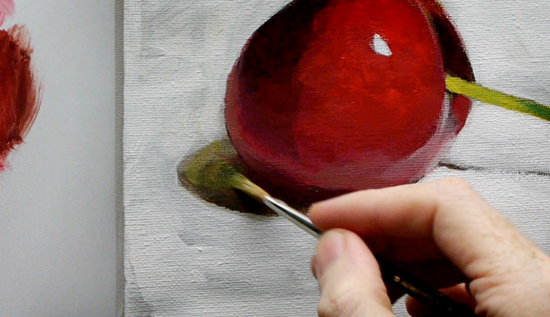 When painting the main body of the cherry and the reflected highlights, were you sometimes using the brush semi-dry? When switching to another brush, do you leave brushes in water (after cleaning off most paint on kitchen towel, rinsing and drying) or do you leave them sitting in fresh air? When you add a touch of white to counter acrylics tendency to darken do you do this only for the brighter colours in a painting? Thanks again Will. I’m making progress. After years of smouldering I think my painting might be about to catch fire! p.s I’ll give the acrylic landscape exercise a bash and let you know how it goes. Yes, often the brush is semi-dry, just dampened slightly. For the highlight I use the paint straight from the tube so it hasn’t been diluted at all. I personally keep the brushes sitting in fresh air, so when I change back to the they have that semi-dry quality. Not necessarily, but it is usually with the lighter colours because this is where a colour shift can become more obvious in your painting. Enjoyed this tutorial. As this is for beginner what happened to limited pallete? Would be good to have a tutorial using limited pallete. Pleased that you have enjoyed the tutorial. In comparision to most beginners palette (10 plus colours)this is a limited choice. How did your painting turn out? I am so exited having found this excellent website. I am actually a ceramic artist who always wanted to paint (my mother was a painter) Now I am 63 years old and I will start. I have all the equipment and I think I will try with this cherry! Hi Pia, thanks for dropping by, with your glazing knowledge this tutorial should suit you well! Looking forward to hearing how the painting turns out. Hi Will, After years of never seriously getting down to painting I am lucky to have an excellent Art School on my doorstep and have already done one term. 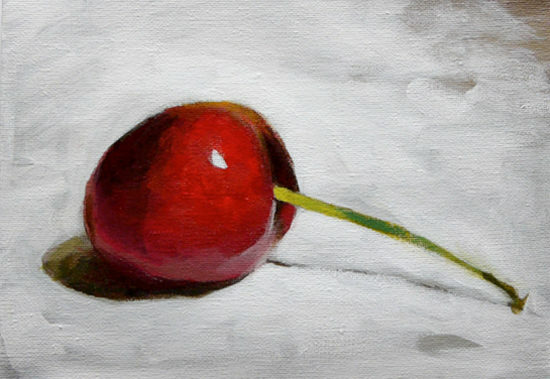 But, what a bonus to also be following you on the Web – I have today produced a great little Cherry painting. I will go on to follow all your tutorials and please do lots more – I love them. Thanks for dropping by, really pleased you enjoyed the cherry tutorial and are finding the tutorials helpful. Hi Will, thank you so much for this tutorial. I’m a beginner and always loved art and tried to draw and paint but never really tried it. So this time I’m willing to learn :-) so thank you! I had 2 tries on this one and my second one isn’t really making me happy since I can see my mistakes. My problem is the colour dries out too quickly for my taste. I had some little tubes of daler rowney and some very cheap ones (I mixed them) now I realized I seriously need a good quality white. So would you take a look at my picture and tell me if its me or the color problem? :-) any recommendations about brands available in Germany? I had a look at your painting and I think it looks great! The red of the cherry is absolutely lovely but yes, a good quality white is always a great investment. I found this online store based in Berlin stocks Winsor and Newton artist acrylics, Lascaux and Liquitex heavy body, all of which are great brands. P.S. Would you like me to include your cherry on the student success page? I found Golden Heavy Body Acrylics at Kremer Pigmente (http://kremer-pigmente.de/de), in München. But they have other shops in Germany and you cal aslo order online. I just paid a visit to Kremer Pigmente and I was just amazed of what thexý have there. You can find quality pigments and already mixed colors. thank you so much. You’re too kind :) Thanks for the kind words, I tried to get used to mixing the colors and realized it wasn’t that difficult as I thought, your videos helped me alot! Bought some better quality acrylics now but will buy the titanium white of the brand you recommended though. I’m happy you want to add my picture to your website, and I’m of course ok with this. :) My next “project” is your landscape tutorial, I will let you know about the success :) Thank you so much for the Link to the shop in Berlin. Good one Rosy, you’re welcome, enjoy the landscape tutorial. Thanks for this tutorial, was very very informative. I thoroughly enjoyed painting it. Your step by step guide was detailed and very easy to follow. Thanks for guiding beginners like myself. Always looking forward for more such wonderful tutorials. Thanks very much Manisha, really pleased you enjoyed painting it. I have really enjoyed coming to your website and trying out some of the tips and looking at your videos. I followed this tutorial and though not exactly like yours I think it came out very well. Will be posting a photo on the blog soon. I am a person of a certain age and never thought I could paint and draw, but it seems I can. Thanks for making these vids and helping those like myself who never did art at school or have trouble finding teachers locally to learn from. You are a star! Bless you. Hi Arlene, thanks for your kind comments and really pleased you’ve had good results with the Cherry tutorial. Great to hear the lessons have been helpful to your artistic journey! Thank you for this video. You are an engaging and enlightening instructor. I learned a lot, had great fun, and was reasonably pleased with my attempt. One puzzle: how do you blend the colors? Without medium I produce thick, pasty chaos. With medium, the paint is so runny. Both ways, I pull up layers underneath. Any advice? Thank you, and I look forward to the other videos…or maybe first my third attempt at the cherry painting! Hi Jen, thanks for your comment, really pleased you’ve learnt a lot from the painting course. 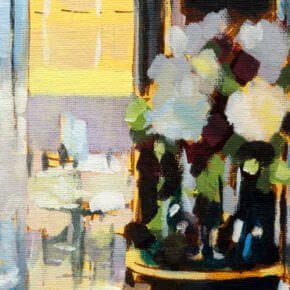 When painting with acrylics you shouldn’t pull up the layers underneath it, unless it is a brand of paint where you can’re-activate’ the paint with water – such as ‘Atelier Interactive acrylics’. Mmm, that’s strange, usually the under-layer of acrylics would dry to a solid film so the next paint layer on top wouldn’t disturb the layer underneath. Blending acrylics can take a bit of practice as the quick drying time can prevent subtle blending when you’re first starting, also getting the consistency of paint right can be a skill in itself, have a look at Lesson 1 of this French cafe scene and I talk about mixing a nice consistency for an underpainting, this might help to solve the issue. Hi Kath, for the sections when we apply thin glazes of colour the paint underneath needs to be dry. For the hi-light the paint can still be wet underneath you just need a gentle touch! Nice to hear from you, so pleased you’ve found the cherry tutorial helpful. You’ve captured the colours and form of the cherry really well. Also, the cast shadow is well observed and again adds to the realism of the painting, great work! Hi Will, thank you so much for your comment. You can’t imagine how happy i’m to get a review from a proffesional artist like you. It surely building up my confidence as i didn’t get the same in local course here in Geoje island, South Korea due to languange barrier. More often i hardly get my instructor point of view and technique verbally. All we (foreign students) do here is learning by doing. Again, thank you! You’re welcome Deissy, pleased it helped. Just started watching your videos and have been learning and re-learning so much! I haven’t painted anything (been busy with graphic design) for the joy of it in about 30 years so I feel like I’m just getting started. Thank you thank you thank you for your site and your amazing style of teaching! I watched the cherry tutorials (all of them, one right after the other) and my 6 year old grandson who was sitting with me at the time was mesmerized! I’m going to be doing all of your tutorials and especially the cherry one with my grandson. I’ll let you know how it goes! Lovely to hear from you and so pleased to hear you’ve been enjoying the videos with your grandson! 6 year olds can be the perfect painting partners as they’re fearless in their approach and have lots of lemonade breaks. Thank you so much for the tutorial. I’ve never painted anything before, and wanted to give it a shot. I’m only 2 hours home from the art supply store and I’ve followed your videos as best as possible. I made a few mistakes here and there, but I’m still very proud of the work I made, entirely thanks to you! I don’t like the “texture” I tried to add to the cherry with those silly dots, and I don’t think I mixed a bright enough red. Either way, I did learn a lot about light and shadow while thinking about the crevice of the cherry where the stem meets the fruit. I can’t wait to try the jug painting next! Thanks again!! Great to hear from you, and thanks for sending through your cherry painting. As your first painting you’ve done an epic job! The form and the colour on the cherry is looking really good, and the brightness of the red works well. Cherries are quite dark in tone and a crimson hue so don’t feel you have to paint the brightest colour possible, less is more. I think if you cropped in tne edge of your canvas to focus on the cherry a touch more it would crete a more compelling composition, and maybe a subtle glaze of the crimson on the white highlights you’ve painted towards the bottom of the cherry. But great work Jake, you should be really proud of your achievement. Thanks, Will! I’ve done the jug painting as well and I’m very pleased with what I’m learning. You’re doing a great service to the world with your site! Thanks so much! Great to hear it Jake, really pleased you found the jug painting tutorial helpful. I was so amazed when the cherry turned out so well, It is the first time I have done a painting without asking someone for help! Thank you so much, it has given me the confidence to paint by myself. Bless your heart for sharing your talent. Great to hear from you, and so pleased you’ve had good results with the cherry tutorial, and the best thing is the confidence in your own work! Cheers Sue, thanks for letting me know. You mentioned that acrylics always dry a little darker than when they’re wet. does this affect all colors equally or are there certain ones to watch out for? and when matching colors do you just go a little lighter to compensate for this or is there a trick to matching a precise color? Colour shift does tend to affect all colours fairly evenly, it will differ from brand to brand and student vs artist quality (for example the Winsor & Newton Artist’s quality paint use a clear acrylic binder so have very little colour shift. 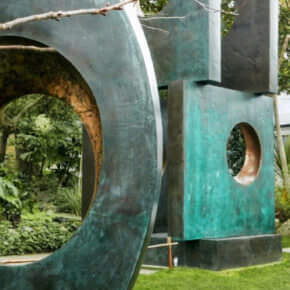 I tend to go a little lighter when matching a colour to compensate, you can try to mix the exact colour and then add a touch of zinc white just to lighten the tone, but this can be a bit of an overkill for every mix you make. This was a great experience and I’ll be back for more. I used water based oil paint after an artist in my area recommended it. They worked out great. How long do you wait for this type of paint to dry before adding glazes..I only waited over night and I think I could have waited a bit longer. Hi Joyce, really pleased you enjoyed the tutorial, drying time depends on how thick you have applied the paints, quite thinly you’ll be okay after a day, but if the paint is a bit more impasto a couple of days and you should be fine. I agree with David! Your website is the best I have come across. So many things to take in and to remember! But boy, do I now look forward to painting and incorporating all this knowledge into my work, especially the coloured background. That opened a whole new world to me! So many things will change in my efforts due to your teachings. Thank you for sharing your knowledge with us all over the world. Thanks very much for your kind words, so pleased to hear you’ve been inspired with your paintings. Greetings! I have very much enjoyed what I have seen of your AWESOME website, and am looking forward to viewing more inspiration! 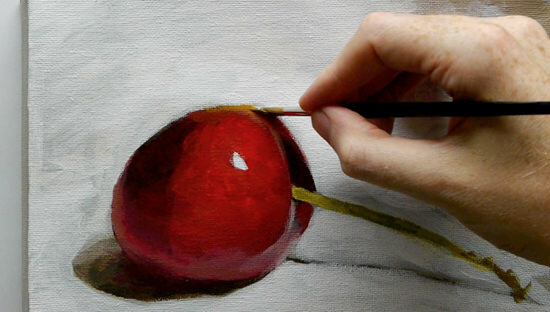 After watching the cherry still life videos, I have what I hope is a quick question for you… what is the reason you work your background around the area of cherry stem, instead of having continuous background strokes in that area and then just painting the stem over the top of the background color? Pleased you’ve been enjoying the lessons, for this particular image I wanted to preserve the ground colour to act as a base for the stem. Thanks Mugar, pleased you enjoyed it. 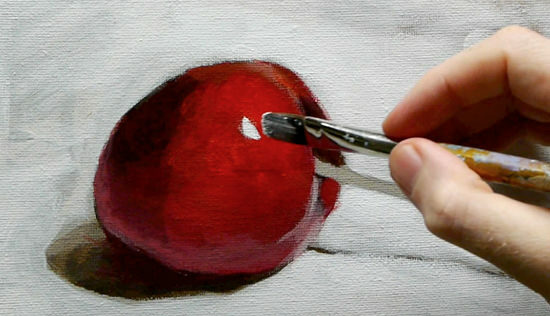 Hi Lu, the cherry tutorial is a good one to learn about classical painting techniques with acrylics, if you are painting very bright colours you can use a slightly different approach. It all depends on the end style of painting that you’re trying to achieve. Hi Lu, just start with the cherry and work through that lesson, to be able to paint multiple objects successfully, you just need to start with one and work through the process. Wow! thank you for this free advice, i tried the cherry yesterday and i’m surprised that it still looks good today as well :). i only have the primary colour’s and white (budgeting), listening to your descriptions helped me mix the colours i needed or very close. Hi Bella, so pleased you’ve been finding the lessons helpful and have created a cherry painting to be proud of! great work. Thanks Jamie, really pleased you’re finding them helpful. Thank you so much. I want to learn to paint with acrylics and was fortunate to find your videos. I am just starting to view them – WOW. You are an amazing teacher and artist. I have watched many videos by other artists and yours are by far the best. 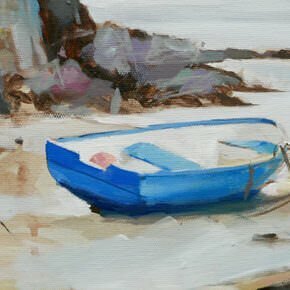 Hi Maxine, nice to hear from you, and thanks for your kind comments on my teaching style, really hope you found the lessons helpful in your painting. Thank you very much Will! I just love your tutorial and how easy and clear your explanations are. The cherry I made last night turned out just great and I will continue to work following your tutorials. Thank you for sharing all this wonderfull experiences with us! You’re more than welcome Irina, great to hear your cherry painting has turned out well and you’re enjoying following the tutorials. I’m so happy I found your website! I have learned more from you in a week than I have in 10 yrs! Just finished the cherry painting. It was so much fun! On to the next! Thank you Will for sharing your amazing talent and knowledge with us! Great one Catherine, pleased your cherry painting turned out well. Can you recommend a good brush to sign paintings with? Hi Catherine, a ‘rigger brush’ can be good for signing paintings. Thanks for your step by step guide for beginners Acrylic painting.i have done the cherry and it is quite good for a 72 year old’s painting. Thanks a lot. I look forward to more of such lessons. You’re welcome Saeeda, really pleased you’re happy with your Cherry painting. Hi Will. When will the update of The Art of Acrylics be available? Love your website. Thanks so much for sharing your knowledge and gifts! 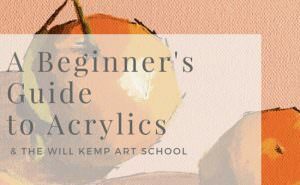 Hi Cathy, pleased you’ve been enjoying the site, should be in the Summer for an updated Art of Acrylics, there is a new beginners acrylic foundation course coming out in the beginning of Feb.
Hi Cath, thanks for your kind words on the videos, so pleased you’ve being enjoying the process. I finally got up my nerve and painted the cherry. It’s my first acrylic painting and I can’t believe how well it turned out! Thank you so much! I’m amazed at how inspiring your site is and how spot-on you are with your understanding of what a new student needs to know. You truly have a gift. I can’t wait to try another painting. Hi Richard, good on you for painting the cherry, and so pleased you’ve surpassed your initial expectations, really hope you enjoy your next paintings. I am a great admirer of your work and a dedicated follower of your tutorials on acrylic painting and everything else in your website. Thanks a lot for sharing the valuable tips and techniques with all of us. I am an amateur in the field of painting. Though I am trying to paint for almost a decade, only now that I am learning the tricks of the trade. Just yesterday I completed the “cherry” painting, your instructions has yielded a considerably good work from me. Prior to that i tried the “Jug” too which was okay result since i need to learn more on the warm and cool colours. I would like to share the cherry painting I have done with you, is there way i can do that? Any kind of feedback from you will enrich me. Please keep on the excellent work on helping us learn more and I will be waiting for more tutorials from you. Hi Ivy, nice to hear from you, and fantastic to hear that you’ve been finding the cherry painting helpful in your painting journey. I would love to see your painting, you can contact me direct via the contact email on the contact page of the blog. I just found all of your wonderful painting tutorials on YouTube. Thank you so much for sharing your knowledge with us! I am an illustrator, but but consider myself mostly self-taught when it comes to painting. Your videos are so helpful! Thank you! Hi Beth, really pleased you’re enjoying the tutorials, hope they’re helping with your work. Thanks Cathy, pleased you’re finding them helpful. I agree completely with all the praise for the site. My cherry painting based on your tutorial is looking really nice. I am going to probably paint some green shades into the background to punch the red up a bit more. Over doing it is kind of my style. I do have a question though. In a lot of your videos you seem able to blend the acrylics with ease. I presume this is just because you are working fast as you certainly don’t seem to be using a dying inhibitor. Is that correct? That’s right Doug, I haven’t added any drying retarder to the paint, just a new gear on the paint brush! Thank you for your free tutorial. I have managed to paint the cherry painting. It looks nice. I might paint some more this summer. Thanks once again. You’re welcome Wendy, really pleased the cherry painting turned out well for you. Thanks very much Terri, really hope your cherry painting turned out well, so pleased you enjoyed it. Finally did this cherry tutorial and loved it! It really helped to loosen me up a little and the finished product inspired my 13 year old granddaughter to draw it in pencil! I’d show it to you but have no idea how. LOL Anyway, thanks for a great tutorial. Hi Cherryse, what an appropriate name for the tutorial! really pleased you enjoyed the lesson, you can attach a file to your email and send the image through on the contact page, just use my direct email. Hi! Just finished my cherry! Larger canvas. It was coming out great until my kids distracted me and I messed it al… Still, I finished it. Didn’t come out as well as I wanted, but still looks nice on the wall! Looking forward to test some more of your tips, I’ve learned a lot with this tutorial! Thanks for the lesson! Good one Cláudia, really pleased you enjoyed the cherry painting. Hi Will I’m amazed at what I’ve just attempted although it’s not as good as the masters painting, I’m surprised that after 2 years of playing and thinking I was reasonable to a noticed improvement that even my wife commented on. I took up art after being diagnosis with ptsd. In a lot of ways it’s kept me sain. Thank you for helping me improve. Hi Steve, great to hear from you and so pleased you’ve jumped to the ‘wow, did you paint that?’ stage. 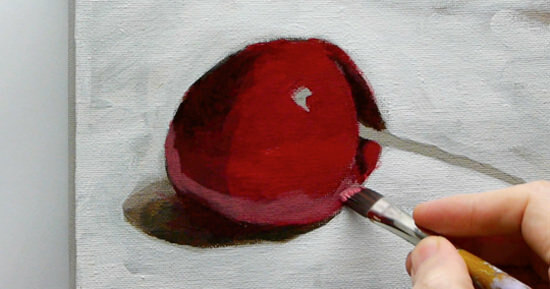 Would love to see your finished cherry painting just attach to my personal email on the contact page. Just wanted to say thanks! I’ve not painted in nearly fifteen years and have been wanting to get back into it for a while without knowing where to start. I stumbled across this tutorial and got stuck in today……. Loved it! I really like the video format so I can pause and paint along at the same time and the commentary is simple to follow too. I’ve got the bug again! Finishing this today has given me a confidence boost and I can’t wait to get on with more! That’s fantastic to hear Erin, thanks for taking the time to comment on your success with the tutorial, so pleased you’ve been enjoying them. Your website is incredible! I am so grateful to have found it. I completed the cherry this evening and I am rather stunned by the good result. I have not picked up a brush in 20 years and have never attempted any form of realism before. I can’t wait to keep going! Thanks very much Viv, so pleased you enjoyed the cherry tutorial and you’re pleased with your results. Hi will I have so enjoyed your cherry course I would like to do some more, thank you . Really pleased you enjoyed it Christine and hope your cherry painting turned out well. Great to hear from you and so pleased you’ve been enjoying the courses, your cherry painting is looking fab! Love the way you’ve smoked the cast shadow and included the subtle glazes on the front of the cherry, it looks brilliant. Thanks for sharing your progress and hope you enjoyed your biscuits! I was having a creative block, couldn’t figure out my palette, how to do anything. So I started surfing the web to see if I could find anything to help me in my dilema. I was searching for a while and came across your site. I thought ok let’s see what he has to say. I started watching your beginner acrylic video, looked interesting. I watched the one with the cherry and the apple. I got up this morning and went to work on a painting I had started the day before I started using some of your techniques and brush suggestions. I even did my paint mixing similar to how you do yours. As I was applying layers of paint the way you suggested I couldn’t believe my eyes. The painting was coming together. It looked as though some one else was guiding my brush. I’m looking at it now. It’s not finished yet but wow what a difference even with the painting I already started. Thank you so much for your videos. That’s fantastic to hear Sallie, so pleased you’ve been finding the techniques helpful in your painting approach. You are an awesome teacher. How great! I am so glad I found your site! I have done a little painting but, I am on a fixed income. Your free tips help so much. I thank you for sharing your talent! What a blessing!!! Good one Terrie, really pleased you’ve been finding them helpful. Hi Will, I sent you an email earlier, but decided to look at this cherry demonstration again and I think it answered some of my questions about my apple still life. I thank you very much for all the great information you are providing for other artists. You are a blessing! Good one Linda, pleased it helped. I have just come across your tutorials! I have watched the cherry developing and got quite excited at the thought of trying to do it myself. For years I’ve been putting off painting, not knowing what to paint. I realise now that starting to practice the techniques is more important. I’m going to give this a go and see how I get on. Thank you for the inspiration. Good one Elizabeth, so pleased you’re feeling inspired, really hope you enjoy the painting. Hi from Toronto, Canada. I discovered your wonderful website two years ago and bought your beginnner acrylic course but neglected to follow through because I lacked confidence. I now realize that I need to start small and start with the basics first. So I tried your cherry painting yesterday. I had so much fun and finished it successfully! What a great feeling! I was so excited that I sent a picture of my cherry to my 24-year-old son in Ottawa and he was very impressed. Of course, I gave you the credit. Like so many of your admirers, I have wanted to paint for many years but never knew where to begin. (I am now 63) Thanks to you, I am now on my merry way and will spend a happy summer painting your apple, jug, etc. As so many others have done, I thank you for your generous heart. Hi Sandi, lovely to hear from you and so pleased you’ve got some great results with the cherry painting and are feeling inspired by the other tutorials. Really hope you enjoy the course with your new painting confidence! I have to agree with all the praise and say how much I have enjoyed and benefitted from your tutorials. I am retired and revisiting my love of painting which went on hold when I left school!!! I now have a dilemma in that I have paintings all over the house. I have been asked if I would be willing to donate some of my daubs for a village event which I am happy to do. Some of my paintings are very much ‘mine’ but I was wondering whether it would be OK to sell the results of the tutorials for a few pounds to cover materials and donate to the village fund. I would mark on the back that they were from a Will Kemp tutorial. Thank you again for being so generous with your time and skill. 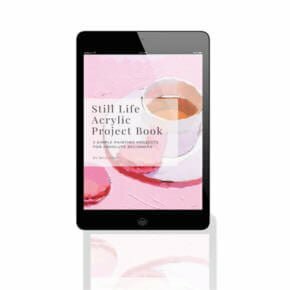 Thanks very much Nicky, really glad you’ve been finding the lessons helpful in your painting progress and yes, by all means, hope they sell well! I’ve just had a go at this cherry, my first bit of painting in over 20 years (and I was no good at all then!) I have really enjoyed trying and overall am happy with the result. Thank you for your great free resources, when I get time I may have to give your paid classes a go. Really pleased it turned out well Adam, glad you enjoyed the cherry. Hi Will, Christopher from Australia, thanks for a great website and courses, I’ve been a designer for years and have decided to get back into Illustration/painting again. Came across your website last year and your courses are very easy to follow which is good. Have done the other 2 and will attempt the b/w oil self portrait. Thanks again. Hi Christopher, so pleased you’ve been enjoying the lessons, fab colours on your cherry, looks great! good luck with the portrait. Thank you so much for your videos! I have now completed two, the fish and the cherry, I have remembered what I forgot, gained lots of beautiful classic technique and I revived and excited about continuing. Cherry painting came out beautifully, the shadow and glazing was just what I needed. Next painting I am not sure what course to pick but I am indeed inspired . I am going to move back and forth using what I learned on fish to go get one now and try again, picking up some cherries and plums to repeat the cherry techniques! 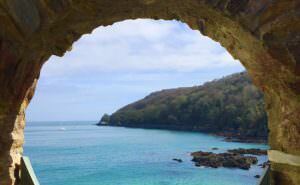 Really Will, a lovely generous service you give to all fellow creatives and for myself teaching sorely missing classical steps. Thank you! That’s fantastic to hear Anita, so pleased you’ve been enjoying the lessons and then translating the methods to your own setup, great job!